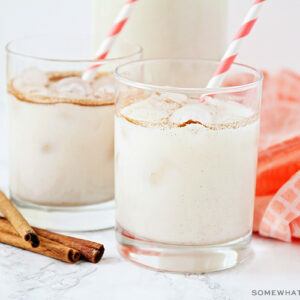 This horchata recipe is quick and easy to make. Made from the delicious combination of milk, cinnamon and rice, this drink is creamy and refreshing. Pour the water and rice into a blender. Blend for about one minute, or until rice begins to break up. Add 3 cinnamon sticks and chill in refrigerator for 4-6 hours or overnight. Strain the rice water into a pitcher then discard rice and cinnamon sticks. Add the milk, vanilla, cinnamon and sugar to the rice water and stir well.